In today’s episode I take a little bit of a walk down memory lane, with Lindsay Price from Theatrefolk. Lindsay runs an online business supporting drama teachers all around the world, through very active communication through Facebook, an email list and a podcast. Together with her partner, she’s also running the online Drama Teacher Academy. 14:40 How Theatrefolk works and how they provide support to drama teachers, especially those isolated. 17:00 The importance of not remaining anonymous in an online business. How Theatrefolk communicates with its community. 28:50 Lindsay shares those projects that didn't work out. The importance of failing and making time to rest. 32:18 The future of Theatrefolk and Lindsay's own writing. 34:00 Lindsay's thoughts on how the new way of doing business presents many opportunities for artists to make a living from their craft. 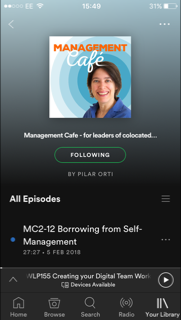 36:06 Pilar shares her thoughts on writing on paper and gives a short overview of the course on managing virtual teams. "It's really important to be human, particularly in an online business."